Whenever someone is described as “Over The Hill”, it is more often than not that said person is old and has gotten on in his or her years, where they qualify for senior citizen’s discount wherever they go. One thing’s for sure, their eyesight might fail, hearing might go deaf, and there is also a very real possibility that their teeth start to loosen and fall out. 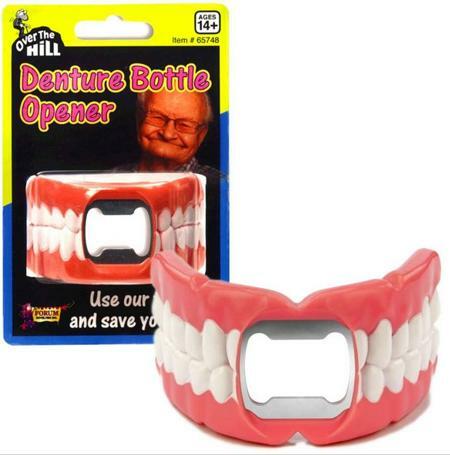 Well, the $7.99 Over The Hill Denture Bottle Opener would make sure that any old folks who want to maintain their habit from their youth that involves opening up bottles with their teeth will be able to continue doing so, even without their dentures. It is definitely hilarious, it looks like a real pair of dentures, although these are ultra strong and durable.